The crazy, and obnoxious game, Goat Simulator, exploded in popularity in August earlier this year, with over 1.1 million copies sold on Steam, and estimated 500,000 copies sold on mobile. Fans have asked time after time again for a Goat Simulator MMO Simulator and now, the developers have stated they are transforming Goat Simulator, into a massive multiplayer-like game. Coffee Stain Studios is the company that originally developed and published Goat Simulator, revealed their second expansion to the original game. The game will have a RPG-like world, which will include different quests and challenges. How much more random can this game get? Steam users who have already purchased the original title on Windows platforms, will have the ability to download the newest patch for free, on Thursday, November 20th. Players will have the ability to choose from over six different goats, and yes, you can choose different classes for your goats. Coffee Stain Studios did release the MMO style classes to the public during a interview, which include tank, rogue, magician, hunter, microwave, or you can choose to have no specific class. The game bases itself off of Blizzard entertainment's World of Warcraft. 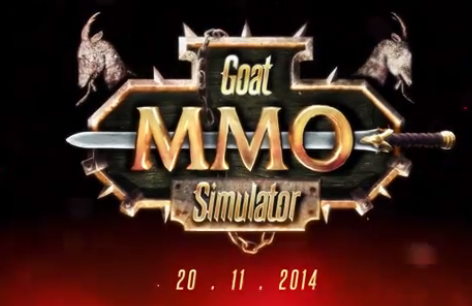 Goat Simulator features a level cap of 101, which is one above World of Warcraft's current max level. During a interview, Armin Ibrisagic (Coffee Stain Studio's PR manager and game designer) said that the dozens of quests will not have much content, but still challenge players. During the interview he also made a claim saying that Goat Simulator will be making its way to the Xbox One at some point in time, but no other information was mentioned about it transferring over to next generation consoles. It would definitely be interesting to see Goat Simulator on Xbox One or PlayStation 4. I think anyone who has purchased the original game, including myself, can agree that they are excited to see how Goat Simulator plays out as a MMO simulator. What are your opinions on the new upcoming MMO simulation? I have provided the multiplayer trailer, to give you a better look in the multiplayer experience. If you have not been given the opportunity to play the original Goat Simulator, it is currently available on Steam.